If I had to pick one type of cuisine that is horribly misunderstood, I would say it’s Indian food. Everyone hears “Indian” and they think “curry”, but I am here to blow your mind. Are you ready? NOT ALL INDIAN FOOD IS MADE WITH CURRY!! AMAZING!! WHO KNEW?! Ok, Indian food has a significant amount of curry, but it also utilizes other spices and not everything is flaming hot either – another misconception of Indian food – that everything is spicy. There is a difference between spicy as in temperature, and spicy as in spiced with a lot of herbs and seasonings; Indian food is heavily spiced, but it’s not always spicy. Get the difference? I happen to love Indian food, and so I stopped into casual eatery Desi Galli in Murray Hill or “Curry Hill” as this area has been dubbed (not helping with the stereotype, eh?) for a quick bite or two. 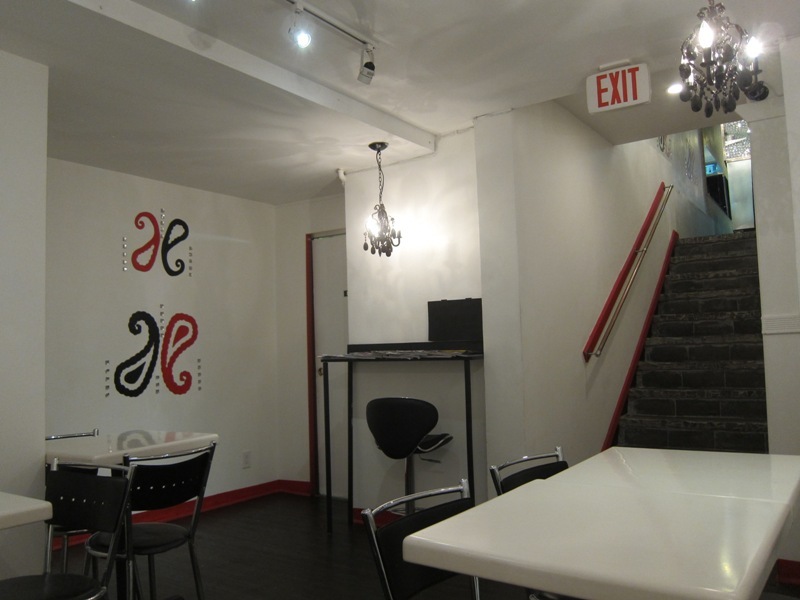 Desi Galli is a small place with a downstairs seating area that probably seats 15 people – you can place your orders upstairs and then the friendly staff will bring it down to you. I wouldnt necessarily come for the ambiance, but I would come for the food – it’s a good, affordable dinner or lunch spot. 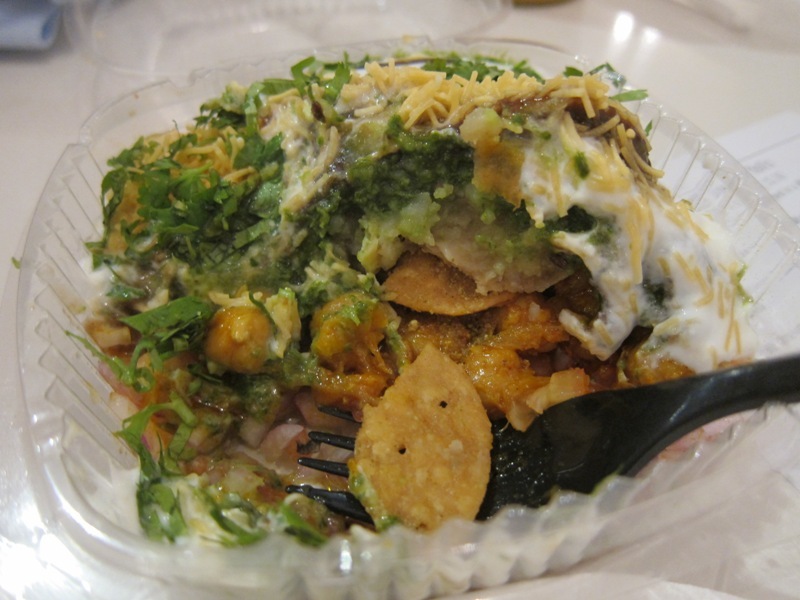 We started off with the Samosa Chaat and the Bhel Puri. 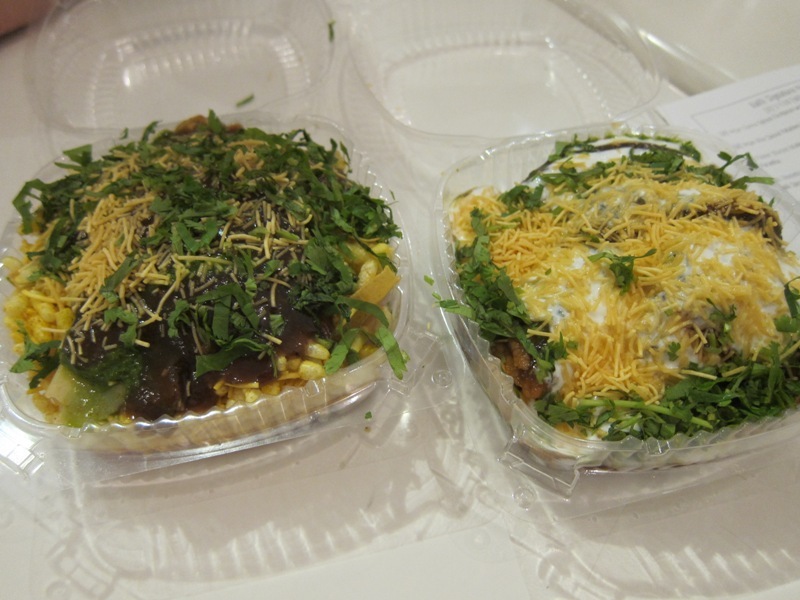 The Samosa Chaat was really tasty – two potato and pea samosas cut in halves served over chopped red onion, chickpeas, and peppers with a nice spread of chutney, yogurt and crispy noodles over the top. We loved this one – the complex flavors and textures dance around in your mouth, and it’s not overly spicy. It looks like a small portion but trust, it is filling. The Bhel Puri was interesting – it reminded me of savory cereal thanks to the puffed rice – like Rice Krispies took a trip to India. This consisted of spiced potatoes over more chopped red onions, puffed crunchy rice, a sweet-ish sauce that I couldn’t decipher, and coriander chutney. I think the Samosa Chaat was the best appetizer, but this one was pretty solid too. I like potatoes pretty much any which way, but the crunch from the puffed rice helped make this one more than just a pile of potatoes. 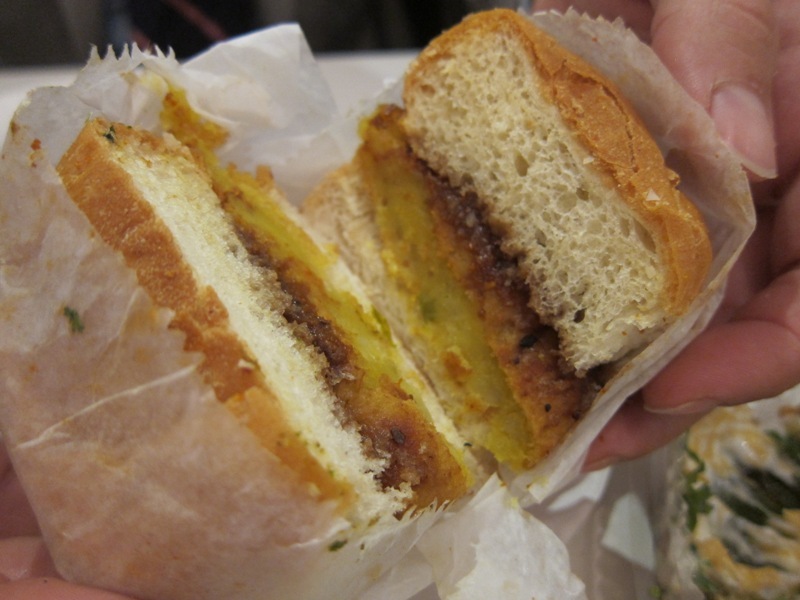 My next favorite thing would have to be the Vada Pav, a spiced potato fritter slider with chutney on a roll. This was a great little sandwich and very filling, which I will attribute to the potatoes. The fritter was not mushy or too crispy, it was a perfect consistency and blended in really well with the soft roll. 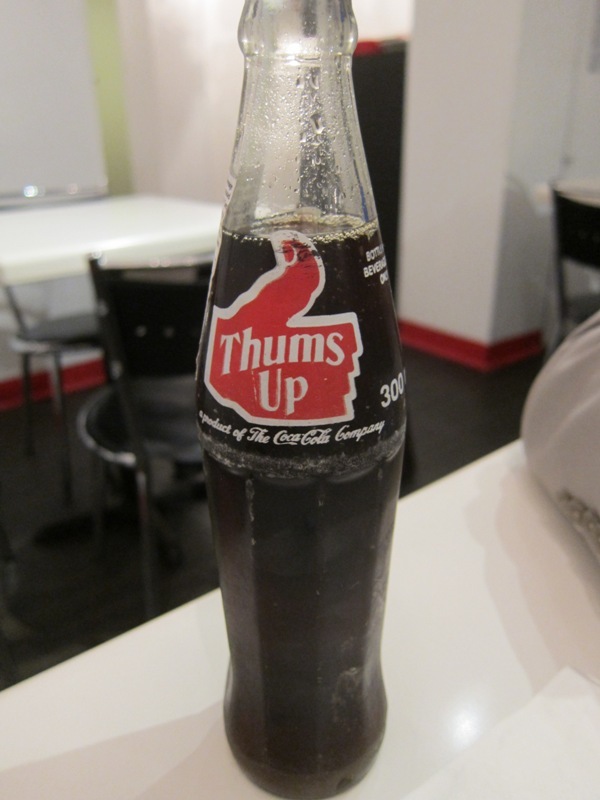 Wash it down with Thums Up! The Indian version of Coca Cola, and you’re good to go for a quick and savory snack. Only downside would be based on size (something like a large fist), I can’t imagine having ONLY that for a meal. Vada Pav – tasty and only $3.29! They forgot the “B”, but thats cool..
Seekh on top, Chicken Tikka on bottom, $5.99 each! 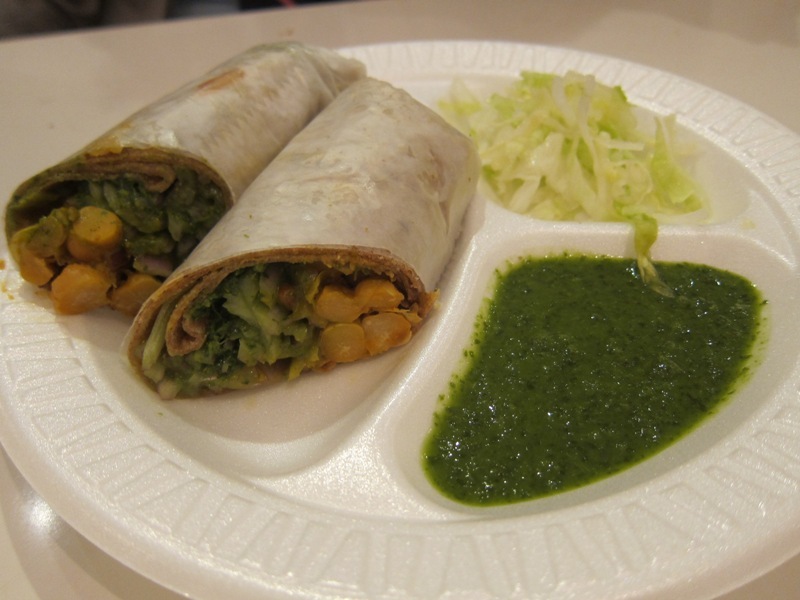 Personally, I liked the vegetarian Chana roll the best: chickpeas, sauce, and onions make up this roll, but the coriander chutney is where it’s at for all three of them. A little dip and you’re in flavor city – and I hate cilantro, which is coriander’s cousin, but it’s good I promise. However, I thought the chicken tikka NEEDED the chutney, whereas the Chana and the Seekh really only were heightened because of it. Lastly, we move onto dessert. YUM! 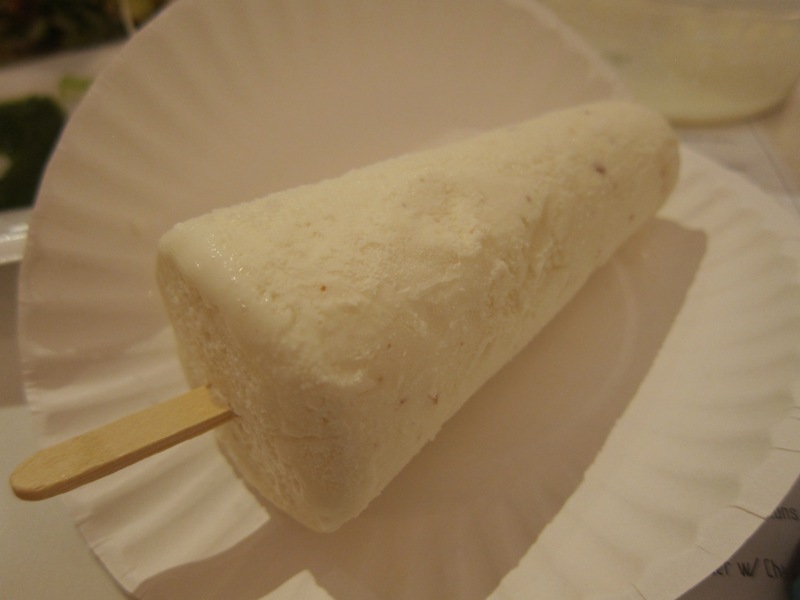 Desi Galli serves Kulfi on a stick like an ice pop. What a fun idea! Never thought of having it that way but it was delish. Kulfi is a traditional, saffron-flavored Indian ice cream that’s not overly sweet. 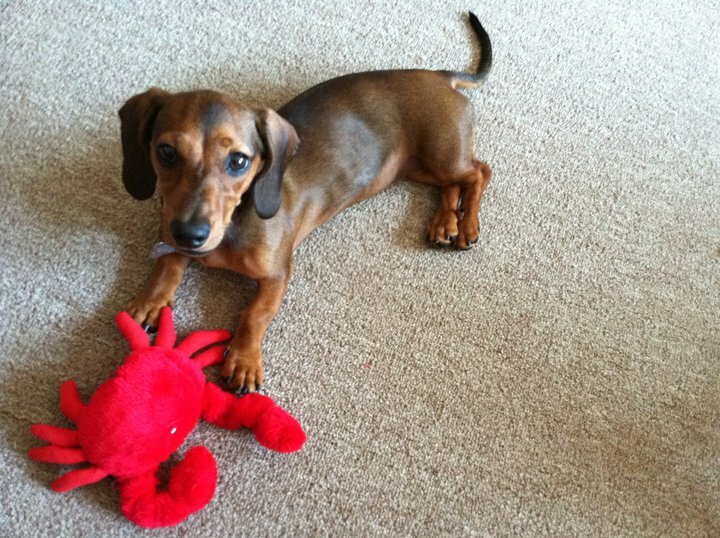 ‘Kulfi’ is also the name of my friend LG’s dog, that’s how much she loves kulfi. Might be a bit of a problem that now I associate Kulfi the ice cream with Kulfi the dog though…regardless, I enjoyed it. 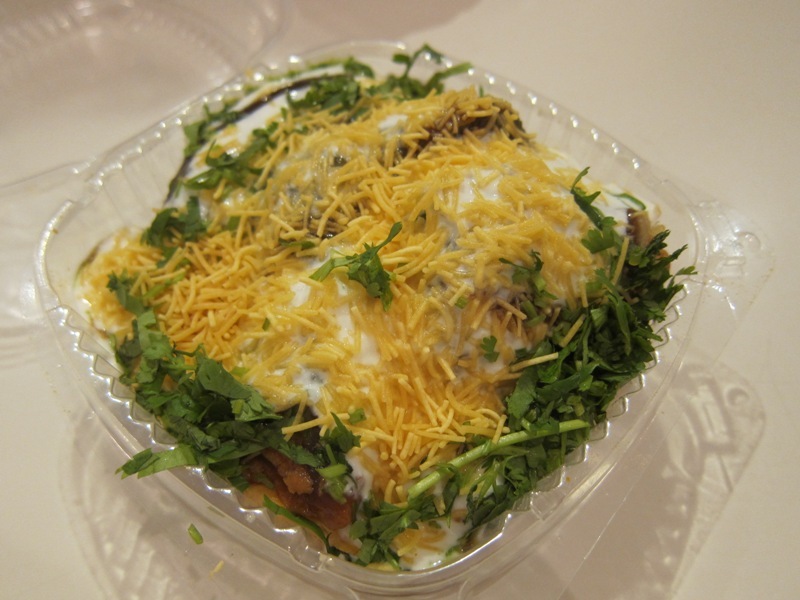 I think that there is a lot of competition in this area, but Desi Galli definitely has a good, affordable menu – I just see it more as a takeout/casual dining option then some place you go for a long meal. Definitely not a bad thing, considering there are only so many salads and wraps one can eat during a midtown lunch break. My two must try’s: Samosa Chaat and Vada Pav. 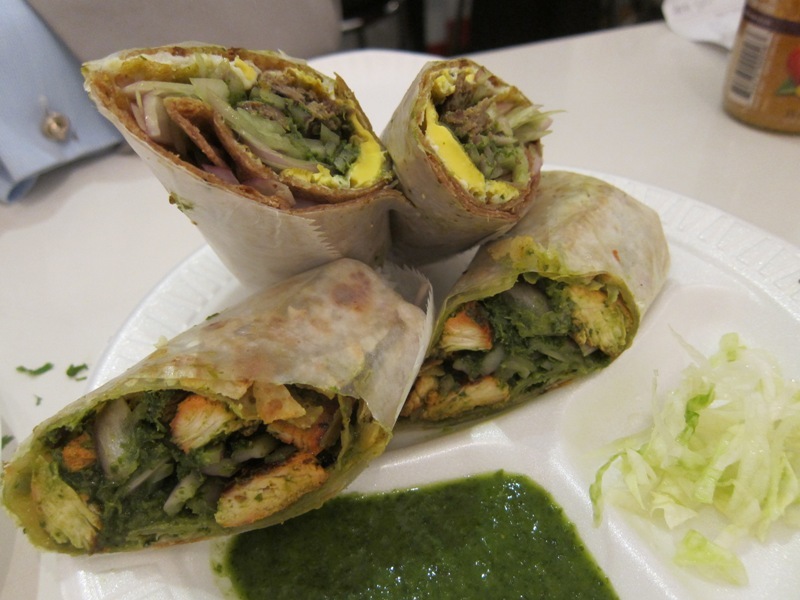 If you must do a kati roll, do the Seekh kebab. You’re welcome.